Let’s talk pizza for a moment. Thick, gooey, fluffy dreaminess that you can really sink your teeth into. Not from a store or from a greasy take out place. But from your own kitchen. For pennies. No rising time. No kidding! 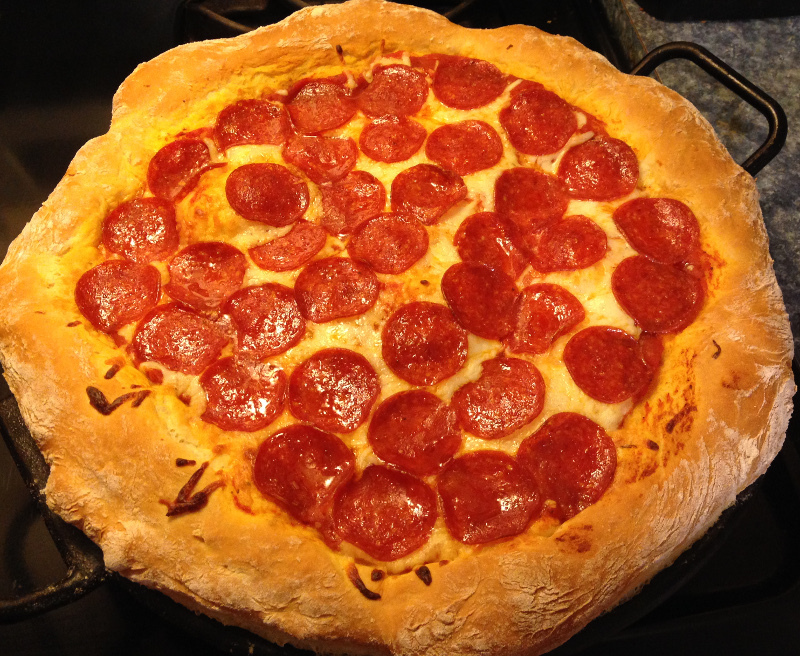 I’ve been making this pizza every week for 20 years; as a stay at home mom, as a working mom, rain or shine. I could probably make it in my sleep. It takes 20 minutes to prep, 20 minutes to bake. And it costs just $6 for two huge pizzas! 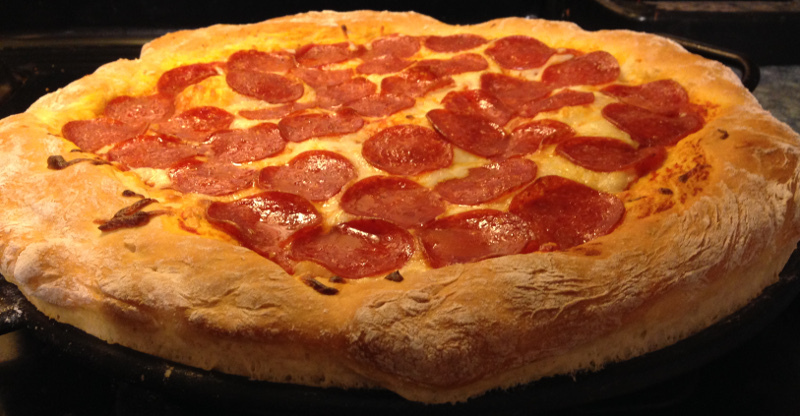 The crust is wonderfully fluffy. The cheese is gooey and the sauce, oh my gosh the sauce is amazing. 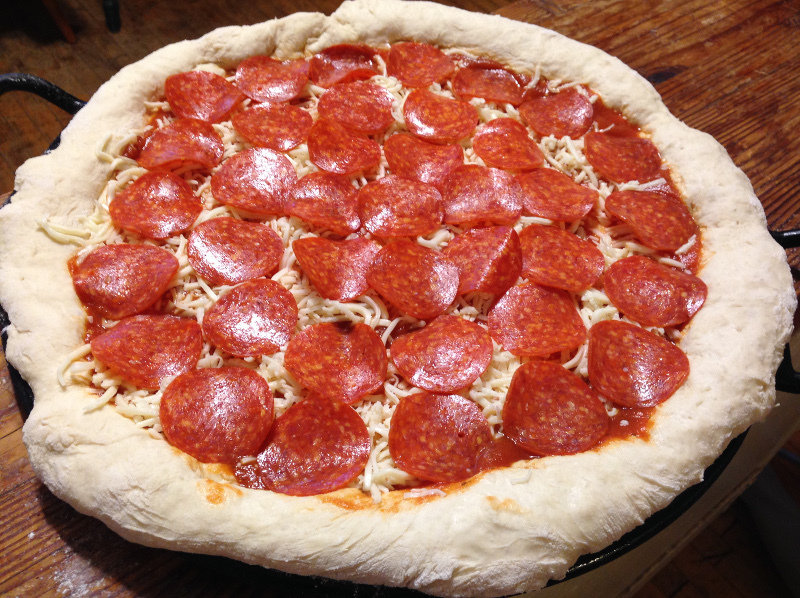 You can add whatever toppings you like, but everyone here prefers pepperoni, so that’s what I make. The best ingredients don’t have to be expensive. My weapons of choice when making these pizzas are easy to find. I buy shredded cheese and pepperoni from Aldi. We’ve noticed that other brands at other stores have a different taste. A bag of Aldi shredded mozzeralla is $2.99 and a bag of pepperoni is $1.99. The only other costs are the flour (about 50 cents worth), a small amount of yeast, sugar, and oil; and 1/2 a can of Hunt’s Garlic and Herb Pasta Sauce, which is usually on sale for $1. Working the pizza crust into the pans. I especially love the Lodge Cast Iron pans and need to buy more of them. I always end up with one big pizza and one super puffy smaller one! Lopsided pizza goodness! 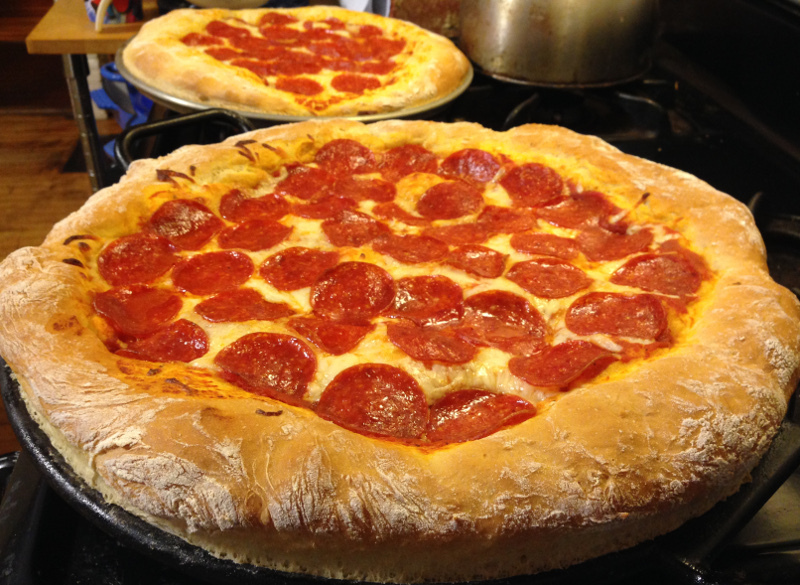 The pizza crust starts rising immediately after working with it. No rising time is needed. The secret is in the consistency of the dough itself. Add flour a little at a time until it’s not sticky. You don’t want it stiff. You want it to be very soft, pliable and smooth. It may even feel a bit “loose” or “relaxed”, even floppy; like it’s not stretchy or elastic at all. That’s ok! As long as it doesn’t stick to everything and is soft, you’re good! The yeast will rise just fine if the mixture foamed up earlier. The dough last night was very loose, soft and pliable, and look at much it rose! Leftovers keep well, but they won’t last. 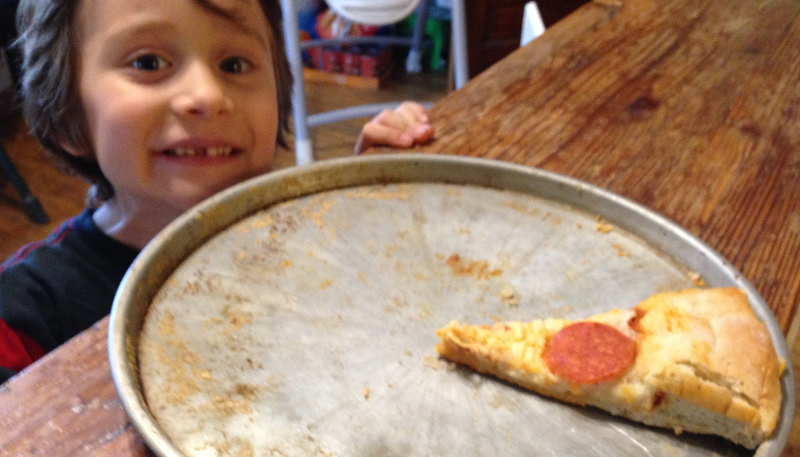 Last night, some nocturnal creature (probably a teenager) got up and ate almost all the pizza. Look who found the last slice! Leftover pizza is an endangered species here. Anyhow, on to the recipe! Preheat oven to 400 °F (204°C). Put the yeast, sugar/honey, and the oil in a very large bowl. Pour the warm water over it and stir until dissolved. Let sit in a warm place until foamy (about 5-10 minutes). Meanwhile, assemble the rest of your ingredients. Open bags, cans, etc. Grease 2 large round pans with oil and set aside. Once you have a bit of foam on the surface of your yeast mixture, it's go time! Stir 3½ cups of flour into the mixture with a large wooden spoon. The dough will be really sticky. Important: The goal is to add flour a little at time until it's soft, smooth and pliable; not sticky or stiff. You will learn to "feel" when it's right. So take your time adding flour. You can always add more but you can't take away. The consistency of the dough is the secret to this recipe! Add flour, about a half cup at a time, until the dough is soft, smooth and not sticking to the spoon. At this point, set the spoon aside and knead for a few minutes in the bowl with your hands, sprinkling more flour in to reduce the stickiness. Dough should stay soft and not be stiff. 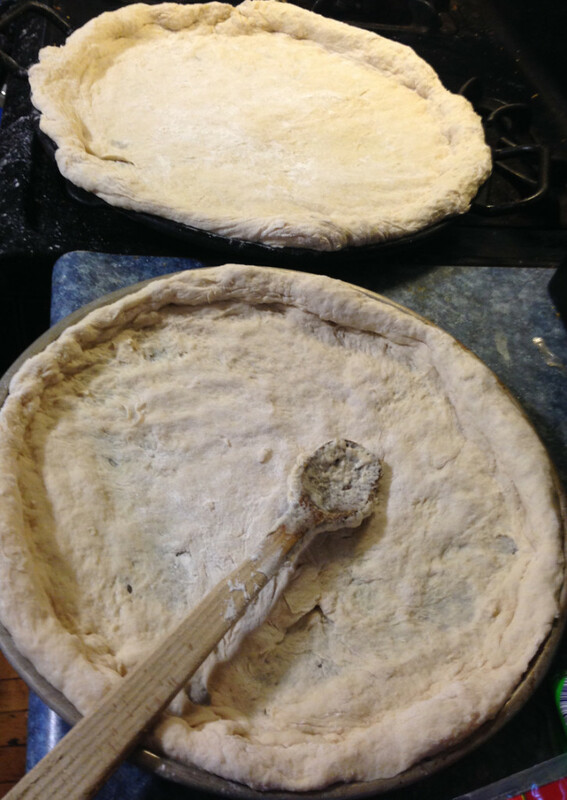 Pinch dough into two halves. Sprinkle a little more flour on it and turn one ball onto the pan, working it towards the edges with your hands and adding more flour in small amounts as needed. Do this again for the second pizza. Sprinkle half the bag of mozzerella on each pizza, and top with pepperoni and any other topping of your choice. Bake at 400 degree for 20 minutes. Let cool for 5 minutes and serve! -This recipe is very adaptable. You can substitute up to half of the white flour with whole grain flours and you'll still get a nice, fluffy crust. Over half, and it'll turn out denser but very good. -You can use whatever sauce and toppings you like. You can make it vegetarian and even vegan by changing out the cheese to a non-dairy one. -Please note that some vegetables will release water when they bake and make the pizza look a bit runny. If you cook a few extra minutes (perhaps lower the temperature the last few minutes), the water should evaporate. 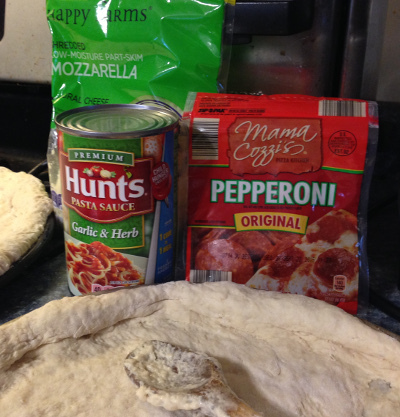 -You can also use this pizza crust to make breakfast pizza and also cinnamon rolls. It's very versatile! -I haven't tried using gluten free flours yet, but that's next on my list!